Want a great piece of real estate investment advice? Invest in Atlanta real estate this year. In fact, we’re not the only real estate experts who think the Atlanta housing market 2018 is one of the best places to invest in real estate. And with all eyes on Atlanta, GA, real estate investors need to turn their eyes to the major market trends. Let’s take a closer look at the Atlanta real estate market trends of 2018. House prices are on the rise in the current housing market, nation-wide. The Atlanta real estate market 2018 is no different. According to Zillow, investment property values rose an impressive 13.8% in 2017. That beat the US housing market’s average increase of 8.1%. While Atlanta may not be the best place for affordable investment properties, house price growth is forecast to slow significantly in 2018. An Atlanta investment property will appreciate by 3.7% by May 2019. With the current Median Property Price (according to Mashvisor’s investment calculator) of $465,824, that’s almost a $20,000 increase. Practically a down payment for a cheaper investment property. Does this specific real estate market trend mean you should wait to call yourself an Atlanta real estate investor? If you have any real intentions to invest in this housing market, don’t wait. Even though real estate appreciation is slowing down, it’s definitely not stopping. Not in the Atlanta real estate market 2018, not really anywhere in the US. If you wait a few months to start your investment property search, any real estate investing budget you set beforehand will have to be increased. So, why wait? Invest in Atlanta real estate now and benefit from real estate appreciation rather than suffer from it. Want to find more affordable investment properties in the Atlanta real estate market? They do exist. You just need two things to locate them: Mashvisor’s heatmap and property finder tool. Two trends that tend to go hand in hand: as house prices increase, so do rental rates. While this is normal in real estate investing, it’s even more apparent in this city. Invest in Atlanta real estate rental property and enjoy the fact that rental rates are increasing 3 times faster than the national median rent prices. Heard anything about the San Francisco real estate market? About how it’s very expensive and the competition is killer? Well, Atlanta rental rate increases are actually exceeding this market’s as well. According to Mashvisor’s investment calculator, here is the current median rental income in the Atlanta real estate market. These real estate analytics are divided based on the rental strategy of your choice: traditional or Airbnb. The expected monthly rental income is already high and will keep growing for real estate investors implementing either rental strategy. As we take a look at other Atlanta real estate market trends, we’ll see that demand for rental properties is on the rise. So, the increase in rental rates is one trend a real estate investor can depend on to be around for the entire year and into the next. So while the return on investment metrics of cash on cash return and cap rate may not hit ideal highs in the Atlanta real estate market, they’re pretty decent if you compare them to the values of most housing markets across the nation. The best part? You can invest in any one of these rental properties right now. Just click here to see the complete list of top-performing Atlanta investment properties with addresses and a complete investment property analysis as well. Check it out! Atlanta, GA is #6 on this list for the best places to invest in real estate for the highest returns. The housing inventory shortage is a real problem in 2018. While real estate developers are working hard to remedy this, the demand for rental property/investment property just can’t be matched. So far in this year, the Atlanta real estate market is seeing a month-to-month increase in housing inventory and new listings. Just looking at May 2018, the housing inventory added up to 13,156 units. There were 5,202 new property listings as well. This was a 5.6% increase from April 2018 and the supply was up to 2.7 months from 2.5 months. While we’re seeing a slight rise in housing inventory, it’s still down 10.2% from May 2017 and new listings fall short by 6.6% from last year as well. Atlanta real estate investors seem to be dealing with a seller’s market, right? We all know low housing inventory is a major symptom of a seller’s market. It can make buying an investment property all the more difficult. But, let’s take a closer look at this trend in Atlanta before we name it a seller’s market or buyer’s market. Atlanta Real Estate Market Trends- Buyer’s Market or Seller’s Market? Looking solely at the shortage of investment property supply, we might say very plainly the Atlanta real estate market 2018 is a seller’s market. But, if we look at things like the sales-to-list price ratio and days on market, things aren’t so black and white. In fact, according to Zillow, Atlanta is actually a neutral market that barely tips in favor of sellers. So while the median property price may be high, not only can you find more affordable investment properties in certain neighborhoods, but you’ll have some negotiating power to lower prices in this market as well. Learn why this makes Atlanta a great choice among markets in the US: Is the 2018 US Housing Market a Seller’s Market or a Buyer’s Market? Choosing where to invest in real estate depends on so many things including the state of the economy and the population growth rates. Of course, with all of the positive trends we’ve seen so far for the Atlanta housing market, you can probably guess there are equally positive economic and population trends. A study by POLICOM for the strongest economies in the nation put the Atlanta-Sandy Springs-Roswell metropolitan region at #15. While it didn’t exactly make it to the top 10, the city is getting there. Just three years ago, it was ranked at 61. Why is this important? Growth. The best places to invest in real estate are those that are forecast to grow and improve as the years go by. For a real estate investment, that means not only will 2018 bring good returns, but next year and the year after that will bring even greater profit as the economy stays on this path. Looking at the population growth from 2016 to 2017, Atlanta was named the third-fastest growing metro area in the US. Nearly 90,000 people moved to the city in that time-frame. Essentially, a landlord in Atlanta with good property management and a rental property in a desired location won’t have a major issue with vacancy rates as demand increases with population growth. What about Airbnb Atlanta? We saw that Airbnb rental income according to Mashvisor’s investment calculator is pretty high in this market. And rented.com places the Atlanta real estate market in #10 for the best places to buy a vacation rental property in 2018. This is among 150 other cites based on ROI, return on investment. Based on the fact that the city received 53 million visitors in 2017, an increase of 1 million from 2016, it’s no surprise vacation rentals do well here. With major real estate development projects focused on upping tourism as well, Airbnb Atlanta will continue to grow and make money for real estate investors who choose this rental strategy here. To start looking for and analyzing the best investment properties in Atlanta neighborhoods, click here. As you can see, telling you to buy rental property in the Atlanta real estate market 2018 is pretty sound advice. 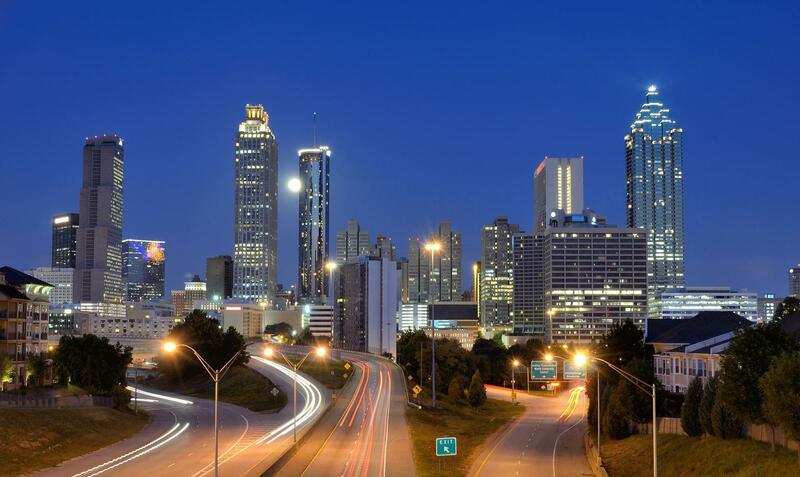 All of the trends point to successful real estate investing, making Atlanta one of the top choices this year. Be sure you succeed with your Atlanta real estate investment by using Mashvisor. Get real estate analytics like those in this post for any US real estate market and invest with confidence. To start your 14-day free trial with Mashvisor and subscribe to our services with a 20% discount after, click here. Sylvia is the Content Marketing Manager at Mashvisor. As a real estate writer, she has been covering topics for the beginner and advanced real estate investor, helping them make smarter decisions as well as real estate agents looking to take their business to the next level. Investing in the Houston Real Estate Market in 2018: Yes or No? Atlanta Real Estate Investment: What’s the Best Property Type?